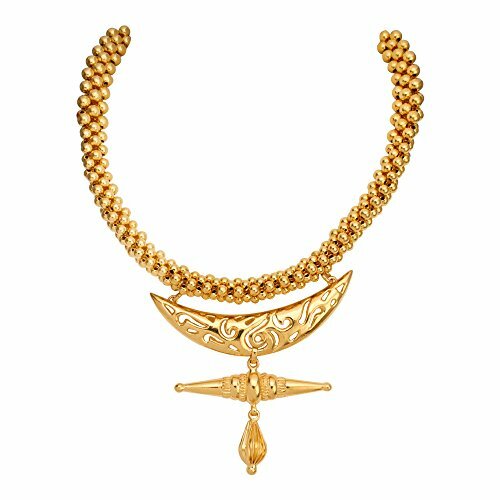 See The Latest Lightweight 16 – 24 Gram Gold Necklaces Designs With Price, Weight & Where To Buy Online in India. We aim to give you an experience, unlike others, when viewing such beautiful Jewellery – no more to just photos floating across a screen with low-quality music! These are some of our favourite Gold Necklaces made in 18 & 22K Gold for Women & Girls, from one of Indians best known Jewellers. Treat Yourself or a loved one with some beautiful and stylish Gold Necklaces, bring a look of splendour and a dazzle to her with some fairly weighty necklaces in 16 to 24 grams! If your really looking to go top of the line, check out these stunning necklaces from Kalyan Jewellers Here. Bluestone offers a huge selection of Gold Necklaces, ranging from simple designs to fancy ones full of Gemstones & Diamonds. Varying across many price ranges, but it caters only to fine jewellery. You can click the image of these pieces or click the ‘Buy Here’ link to go to the website where you can buy these earrings online in India. A beautiful and Delicate piece comes in just 22K Gold with no fancy Gems – the design is however fairly intricate yet simple. This Necklace comes in 21.46 grams and this is only just under 1 lakh – so a pricey piece. Try One of These Ruby Drop Earrings, to go with these Necklaces. Take A look at these Gold Necklace Designs in 10 Grams from BlueStone if you’re looking for something a little lighter in weight. This design comes with 19 Grams of 22k gold and costs a fair amount as such, but if you’re in the market for this karat of gold and weight – then you can’t go wrong with this if you’re looking for something interesting, yet not over the top. This necklace comes from the Goldlites Collection by PC Chandra Jewellers, using a historical theme with the British Empire featured within some of the pieces. This necklace, in particular, is beautifully designed and has Queen Victoria Coins as the pendant part of it, the chain is made up of 3 unique sections with a simple chain link, into a finer chain with more intricacy followed by a solid sheath surrounding the final section. It’s a nice 16 Gram Gold Necklace. 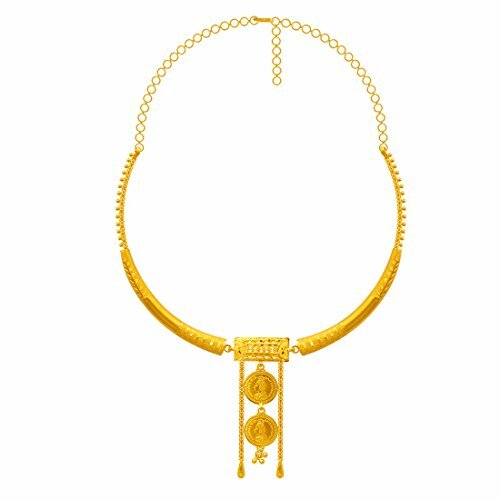 This is a breathtaking piece, with a beautiful sturdy 22k gold choker chain with a large and incredible pendant. The image itself will give you what you need! It’s a precious 19-gram gold choker necklace piece from one of my favourite jewellers, Waman Hari Pethe. This is slightly above the 24 grams that the associated video is about, but I have fallen in love with this beautiful piece and want to share it with you all. If you click through to see all the images, I think you may well too! A very fancy necklace, full of pearls and given brightness by the coral. 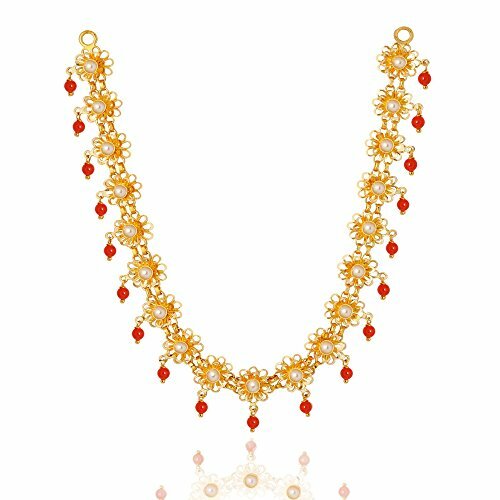 Possesses 19 natural pearls weighing 0.77 grams in total, 19 pieces of red coral weighing 0.72 grams in addition to 26 grams of 22k gold, beautifully crafted into this stunning gold necklace.